TSB Local Pride celebrates people who help others throughout Britain. TSB has genuinely supported local communities to nurture its talents and be the best they can be. We all can share our gifts and talents and make our local community a happier, more cohesive and loving environment. There are often unsung heroes in each local community who tirelessly strive to make it a better place. Over the years many local communities have seen grants and funding cut. But where there is a belief, a desire and a collective effort to make positive change - anything is possible. TSB Local Pride celebrates the people who do all they can to make their community thrive. We are deeply humbled being featured as a Local Pride story. Local communities across Britain all have their challenges. What is refreshing for Urban Equestrian to see, is the talent, the love and the support local communities in Leicester have. We will always strive to do our bit to make our local community more cohesive, loving and happy. We are humbled to see local communities around the country who work together to make theirs a better place. We owe all our current success to the members of our local community who have supported us in so many ways. Volunteers, parents/guardians/carers, local organisations, businesses, the local authority, schools, colleges and the City Mayor's office have supported us, and we thank you. 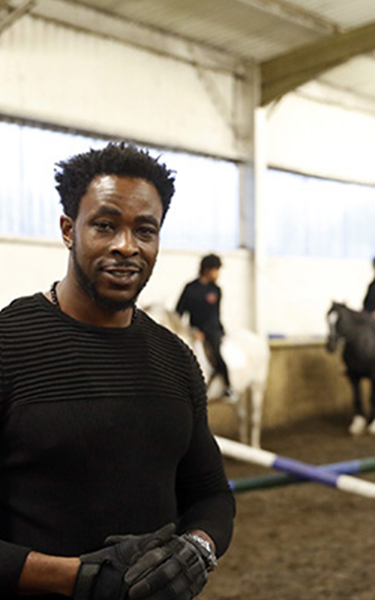 They have all gone beyond the call of duty to ensure equestrianism in the inner-city and throughout Leicester can be accessed by children, teens and adults who have never had access to this beautiful world before. Our Feature as a Local Pride Story came as a huge with shock and we are delighted to be considered as an organisation that makes a positive difference in their local community. Something beyond our wildest dreams has somehow, out of the blue become a reality. The Urban Equestrian Academy loves the city of Leicester. Our city is blessed with many diverse communities, fantastic history and the friendliest people. Like any city, our local communities still face many challenges. With hard work and working together - anything can be achieved. TSB Local Pride celebrates the many people across Britain who are the 'Pride Of Britain'. Everyday people who make a fantastic difference to their local community and the lives of its residents. TSB's partnership with the Pride Of Britain Awards provides the platform for the nation to recognise the courage, hard work and heart of these amazing people. The Urban Equestrian Academy wants to extend a big thank you to everybody that has supported us. Especially everybody who was involved in our Crowdfunding campaign where we successfully raised £8300 for a minibus. Every bit of your support continues to make it possible for us to deliver our services to the local community. For more information please call us on 0116 204 2792 or email us at info@urbanequestrian.co.uk.